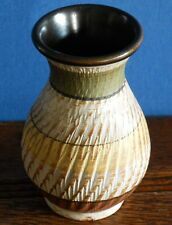 A mid century 4.1/2” pottery posey vase made in Germany by Dumler & Breiden for export in the 1950/60s. 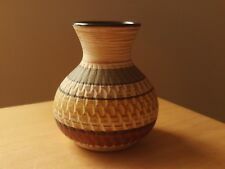 This 'Terra’ patterned vase is incised on the bottom with Dee Cee, Foreign, number 216/42. The Dee Cee refers to the Birmingham based importer Desmond Cooper. 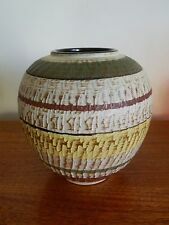 A banded 218 12 cm machined sgraffito Vase with red klinker type body marked Dee Cee Foreign [probably Dümler & Breiden]. Stamped in Black DEE CEE. Good Condition. Attractive Dee Cee German. 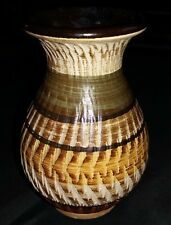 Pottery vase. A pair of vintage German Dee Dee cases 12cm tall. Marked 256/12 and 256/13. Beautiful condition. DEE- CEE - GERMANY GESGESCH - OVAL GEOMETRICAL VASE, STAMPED 235/18, VINTAGE? Height: 17.5cm. Width: 10cm. Length: 12cm. A beautiful antique jug for any collector. Its globe shaped with incised decoration and painted colour pattern. Marked Handerbeit 4 1 5 on the base ( handmade). Lovely shape and pattern. 1960s I think or could be into 1970s. Dee Cee is the larger - almost 6" tall. marked foreign and 210/15. The little one - 3.5" - is marked 137/8 GERMANY. A Vintage German Dee Cee Vase which is approx 10” tall with a width across the top of approx 5”. It’s in very good condition with no damages that I can see. From a pet and smoke free home.